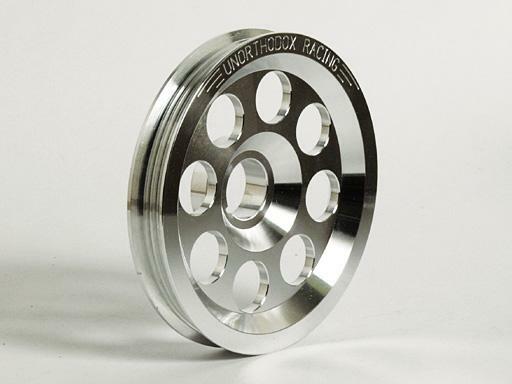 Unorthodox Racing Ultra Series Accessory Pulleys are available individually as well as in our Ultra Series pulley sets. Accessory pulleys for most applications are stock diameter. We do not underdrive with our accessory pulleys for two reasons. Our main reason is because all our underdriving is done with our crank pulleys. This provides maximum weight loss at the crank where most of the horsepower gains are found. Second, not much horsepower is gained from extreme underdriving. It is important to keep charging systems, air conditioning, power steering, and water pumps moving fast enough for every day driving. Since our accessory pulleys are the same diameter as the stock units, you may install our Ultra Series crank pulley as a first step. Then, at a later date, you may purchase our accessories and install them without having to change belts again (on most models). For certain applications underdriving ratios are modified with the accessory pulleys when underdriving is not feasiblewith the crank pulley. In these cases accessories and crank pulleys are only available as a set and are not available individually. Our Ultra Series accessory pulleys cover most of the same applications as our pulley sets. I could not find this part and I needed help so I called in . A gentleman named Hector helped me out and made things easier for me. Your website is great, but I only made this transaction because you cancelled my last one. I tried to order the Deezee brand box and your inventory was off. Hopefully I'll get this one, I really need my toolbox! I appreciated the Amazon pay option.